What does the name Orson Welles conjure up to you?What does the name Orson Welles conjure up to you? The voice behind War of the Worlds? The voice behind Findus Peas? Or the creative genius of Citizen Kane? Well how about this...think not Orson Welles but Awesome Well - for thats where the great man ended up: lobbed down a well on the outskirts of Ronda in Andalusia. Welles and Piedra filmed Chimes at Midnight (7.9 IMDB) in Colmenar, then Madrid, Pedraza, Soria and parts of the Basque country. - eventually completing the film in 1966. Like so many of us today, Welles was man who would start a thousand projects, but complete only so many. Projects would last decades and whilst they dragged on, he would start others, such as this story about the world of the bullfight. Watch this incredible bit of Wellesian propoganda as he pushes for funding about what appears to be an autobiographical piece, introducing the ideas of Reality TV that would come back and haunt us in the 21st century. 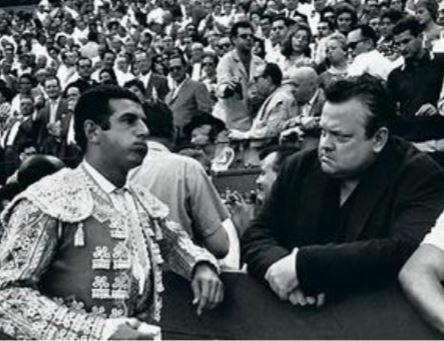 Towards the end of his life, permanently broad-hatted and with a cigar clenched Clint-Eastwood-style between his beardy-lips, Welles spent more and more time in Spain, pursuingp his passion for food, drink and life as well as his fascination for la corrida. On October 10, 1985 George Orson Welles died from a heart attack on the same day as Yul Brynner and the same week as Rock Hudson died. Hollywood pondered on the synchronicity and mourned the loss of such giants. Despite having wished his body to be buried in one of the small villages that appeared in Chimes at Midnight, Welles' body was instead cremated and two years later, the remains of both Welles and Paola Mori were dropped down a well on a small finca on the outskirts of Ronda - a patch of earth owned by an old bullfighting friend - Antonio Ordóñez. Welles was a creative machine: He filmed 13 full length films, 14 short films, 7 TV series and worked on 14 unfinished films. He starred, wrote or produced over a 130 productions in all and 100's of radio programs. Some argue that a man such as Orson, a man with big appetite and a curiosity for life would never be content in the USA. He would need to stretch himself into other cultures and into other lifestyles. Of all the countries in Europe, Spain was the one that unaccountably tugged at his heart. In the final conclusion of his visit to the Basque Country in Around the World, Welles looks starrily into the sky during a firework fiesta on the streets of the town. Then slowly he looks back at the camera and says: "Here in the Basque country people do not end their stories with 'and so they lived happily ever after'. Instead they say 'And if they lived well, they died well.'" Welles looks mournfully back up to the sky and in his face you see the desire to do so too. Did he live well? He most certainly did. Did he die well? Not exactly, but he did end up in a well. And in Spain. Maybe that counts for something. In 2005 Kristian Petri made a short documentary called The Well, in which he travels through Spain looking for the legacy of the large bearded one. Unfortunately, the very day I posted this article the video was removed from Youtube. It may return. let me know if it does. Its worth watching.